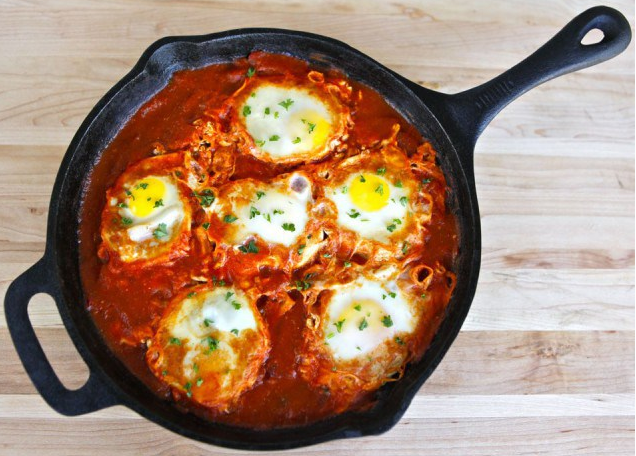 A delicious, traditional egg dish equally as good for breakfast as for dinner. In a very large pan, dry-roast the cumin seeds on high heat for 2 minutes. Add the oil and onions and saute for five minutes. Add the peppers, sugar, and herbs and continue cooking on a high heat for 5-10 minutes to get a nice color. Add the tomatoes, saffron, cayenne, and some salt and pepper. Reduce the heat to low and cook for 15 minutes. Add the water and bring to a simmer. Taste to adjust the seasoning. If desired, you can prepare this part of the meal in advance and simply heat it up later and proceed with the recipe. Turn the heat to medium and make gaps in the pepper mix. Carefully break an egg into each gap. Sprinkle with salt and cover the pan with a lid. Cook on a very gentle heat for 10-12 minutes, or until the eggs are just set. Sprinkle with the chopped parsley and serve.